The third Anti-Navires Léger (ANL, or lightweight anti-ship missile) / Sea Venom missile launch was successfully completed on November 14, 2018 by the teams from the Directorate General of Armament (DGA) and MBDA at the Mediterranean Center range of DGA Missile tests, off the island of Levant (83 - Var), from a Dauphin test helicopter belonging to DGA Flight tests. This test was a medium-range firing with target identification and lock-on before launch. It validated several of the missile’s capabilities in a scenario representative of its future missions, including the "man in the loop" function with target selection by the crew using images transmitted by the missile’s seeker. The success of this test, which follows the success of April 18, 2018, marks the passage of a major milestone towards the qualification of the system. The ANL / Sea Venom program is a Franco-British cooperative venture under the Lancaster House Treaty signed by France and the United Kingdom in November 2010. The ANL / Sea Venom missile is intended to equip helicopters of the French and Royal Navy to combat a wide range of surface threats, from fast-moving and maneuvering patrol boats to corvettes, including coastal environments. The ANL / Sea Venom’s main French platform is the future Hélicoptère Léger Interarmées (HIL, Light Joint Helicopter). The contract for the development of the ANL / Sea Venom program was awarded to prime contractor MBDA on March 26, 2014 by DE & S (Defense Equipment and Support), the British counterpart of France’s DGA for the conduct of the weapons programs. This project is the first joint program, which takes full advantage of the Mutual Dependence provisions approved under the One Complex Weapon initiative to consolidate the French-UK missile industry around MBDA. 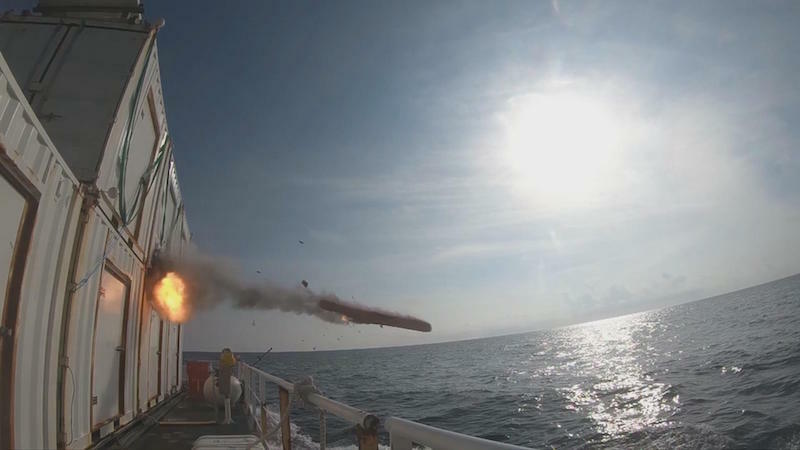 MBDA’s Sea Venom-ANL anti-ship missile has successfully conducted a further firing trial, passing a significant new milestone for the Anglo-French co-operation programme. Conducted on 14 November from a Direction Générale de l’Armement (DGA) Dauphin test helicopter at the DGA Missile testing range of Ile du Levant range, the trial was the final development firing for the missile prior to the start of qualification trials in 2019. This latest trial highlighted Sea Venom-ANL’s lock on before launch (LOBL) capabilities, with images from the missile’s infrared seeker being used by the operator to designate the target prior to launch. Sea Venom-ANL is capable of being launched from a wide range of platforms, and will be used on the UK Royal Navy’s AW159 Wildcat and French Navy future HIL (Hélicoptère Interarmées Léger) helicopters. This 120 kg sea-skimming missile is designed to enable navies to deal with a range of threats including fast moving patrol boats, corvettes and coastal targets. The missile is capable of being fired in both lock on before launch (LOBL) and lock on after launch (LOAL) modes, with a two-way datalink and imaging seeker giving the operator the ability to monitor the engagement, perform aim point refinement, select a new target, or abort the mission if necessary. The missile is being developed under a unique joint programme launched at the 2010 Lancaster House Summit, that is the first to take full advantage of consolidated centres of excellence created within the Anglo-French missile industry under the ‘One Complex Weapons’ initiative.